When Lizzie Dixon was swept off her feet, and moved to London with her sophisticated boyfriend Giles, she never thought it would lead to heartbreak. After a day of pampering and feeling gorgeous, Lizzie thinks that Giles is about to make her a very happy woman, with a proposal. Giles however breaks Lizzie’s heart, telling her that he’s leaving her for his ex Natasha, and to add insult to injury, informs her that they are soon to be married. 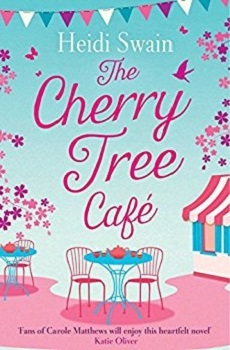 With her life in tatters, she finds solace in her best friend Jemma, who offers her the flat above her newly purchased café, ‘The Cherry Tree Café’. Returning home to the small town of Wynbridge fills her with dread, but what other option does she have? Coming face to face with her old high school crush, Ben Fletcher, wasn’t the homecoming she was expecting, nor needed, especially when it would seem that Ben is not best pleased to see her either. After helping Jemma out financially with the café, Lizzie follows her dream and takes over a corner of the café to start up the crafting classes she has always dreamt of, putting the passion, she has been suppressing, to good use. Can Lizzie get her life back on track and follow her dreams, where ever they may take her? I loved ‘The Cherry Tree Café’ right from the start. The cover is gorgeous and I was overjoyed with the premise of the crafting and cake combination. Lizzie is an intelligent, beautiful young woman who I had a lot of sympathy for. She had lost all of her confidence when her heart was broken in two. She is very caring, but wears her heart on her sleeve, and is sensitive, leading to many misunderstandings, especially with taking people’s comments the wrong way. Moving back to Wynbridge is a big upheaval for her, seeing as she left in such a whirlwind, and she knows that everyone will be talking about her, not helped by her mother, placing an ill-judged article in the local newspaper about her daughter’s, non existent engagement. Ben has his own reasons for not being thrilled to see Lizzie. He’s dealing with his own problems and the return of Lizzie stirs up his emotions once more. Ben has an air about him. He’s mysterious and secretive, but there was something about him that made me really like him. I was dying to know what his big secret was. I certainly wasn’t let down when it was revealed; I was however shocked – it truly wasn’t something that had crossed my mind. Lizzie’s best friend Jemma, her husband Tom and their daughter Ella (6), bring the story to life, especially Ella with her witty comments and eaves dropping. She’s at that age where she views the world in black and white, and tells you exactly how she see’s it. The story is pure chick lit. It had me in stitches in parts and gaping open mouthed at others. I had a lot of empathy for the true to life characters who stayed with me well after reading. The Cherry Tree Café is the perfect summer holiday read. I couldn’t believe that this was Heidi Swain’s début novel, and hopefully Heidi may bring back the characters in a follow up book, as I am sure they have so much more to offer.